What is E2 Manufacturing System? E2 Manufacturing System is an all-inclusive, modular ERP system designed for manufacturers that meet to-order demands. This makes the application created by Shoptech most suitable for their needs as it has the tools necessary for managing specific processes. E2 Manufacturing System has robust applications that let users perform their tasks efficiently. This allows the business’s work processes to continue flowing smoothly, as features like inventory monitoring and task scheduling aid in eliminating possible operation bottlenecks. E2 Manufacturing System also provides unparalleled customer care. The support team is prompt in replying to queries and requests for technical help. In addition, they provide scheduled classroom training for new users to help them get acquainted with the solution. With E2 Manufacturing System, users can include as many information as they need into their price estimates and quotes. This transparency lets them gain the trust of their prospects and clients, as they can show the costs of development for each part. Additionally, E2 Manufacturing System enables sales representatives to include supporting files like AutoCAD models with their estimates for target customers to see exactly what they can expect from the manufacturer. Missing parts and raw materials can affect a company’s bottom line. Thus, they must always ensure that everything in their shops is accounted for. They can do this granularly with E2 Manufacturing System, as the solution has a barcoding functionality that lets users simply input a resource’s availability into the system with one scan. This, as well as the software’s mobility, saves users time and makes sure that the manufacturer has enough materials to meet their clients’ needs every time. Improper task scheduling can result in bottlenecks that can negatively impact a shop’s operations. To avoid this, they have to ensure that each task is assigned to an available worker and is completed in the designated amount of time. E2 Manufacturing System can aid shops in this regard, as it has robust planning and scheduling features that let shop owners and managers drill down into the tasks of the day. The application also assists in ensuring that jobs are on track by making certain workers have all the materials necessary for the on-time completion. E2 Manufacturing System provides manufacturers with in-depth information regarding their operations, from job costs to other production data. This helps businesses assess their expenditures and maintain profitability while ensuring that clients’ requirements are met adequately. Happy customers are a key to a business success. That is why shops have to make sure that they offer products that are of high quality to keep their clients coming back. E2 Manufacturing System aids them in this aspect, by identifying problems that may harmfully factor in the manufacturing process. This way, they can get rid of complications and continue with producing quality products. Each organization has different requirements and requires a software that can be personalized for their size, type of employees and clients, and the specific industry they are in. For these reasons, no software can offer perfect functionality out-of-the-box. When you look for a software system, first be sure what you want it for. Read some E2 Manufacturing System reviews and ask yourself do you need basic features or do you want complex functionality? Are there any industry-specific features that you are looking for? Find the answers to these questions to help your search. There are lots of factors that you need to mull over and these include your budget, particular business requirements, your company size, integration requirements etc. Take your time, try out a few free trials, and finally select the app that offers all that you need to enhance your company efficiency and productivity. How Much Does E2 Manufacturing System Cost? We realize that when you make a decision to buy ERP Software it’s important not only to see how experts evaluate it in their reviews, but also to find out if the real people and companies that buy it are actually satisfied with the product. That’s why we’ve created our behavior-based Customer Satisfaction Algorithm™ that gathers customer reviews, comments and E2 Manufacturing System reviews across a wide range of social media sites. The data is then presented in an easy to digest form showing how many people had positive and negative experience with E2 Manufacturing System. With that information at hand you should be equipped to make an informed buying decision that you won’t regret. What are E2 Manufacturing System pricing details? What integrations are available for E2 Manufacturing System? 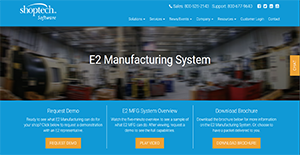 If you need more information about E2 Manufacturing System or you simply have a question let us know what you need and we’ll forward your request directly to the vendor.